This kit is an inspiring collection of fusing accessories specially designed to allow you to create beautiful and unique fused glass projects right in your microwave oven. Really! We've done it ourselves and lived to tell about it! The kiln's outer measurements are 3 1/4" H x 4 1/2" D, with an interior fusing platform of 2 3/4 ". At this size, you can see that you will be creating items smaller than about 2 inches, which is perfect for making pendants, bracelets, earrings and home décor. Create stunning glass items in a matter of minutes by simply layering glass and various embellishments, and fusing them all together in a microwave. 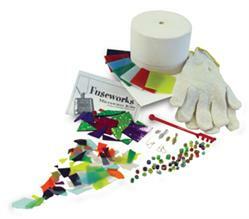 The kit contains 11 essentials tools and accessories, including 90 COE glass, to start fusing right out of the box. The microwave kiln also works great with kiln fired glass paints and Precious Metal Clay (PMC). Kiln paper - 2 pc. 90 COE Fusing Glass - 7 pc. Large & small silver and gold bails - 1 ea. Silver & gold earring set - 1 ea.